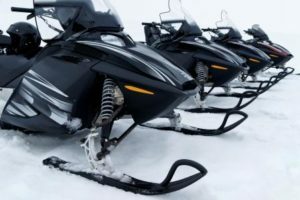 When you plan to store your snowmobile during off months, it is essential that you take a few extra precautions to ensure that your ‘sled’ is running the way you remember when you take it out next season. Following these simple steps will keep your snowmobile running its best and protect your investment for years to come. Store your Snowmobile in a Cool, Dry Place. Wash your sled prior to storage to remove dirt and rinse off the corrosive salts and acids. Use 303 Multi-Surface Cleaner for stubborn areas. Then, protect it with 303 Aerospace Protectant. Shield it from dust by using a porous, not plastic, cover. Plastic may trap moisture and water inside the cover. Fill your tank with fresh gas & use STA-BIL Fuel Stabilizer. The best solution is to fill your fuel tank 95% full of fresh fuel and add STA-BIL® Fuel Stabilizer. STA-BIL will keep your fuel fresh for up to 12 months. Make sure you read the directions carefully – 1oz of STA-BIL will treat up to 2.5 gallons of fuel. Remove the Spark Plugs and spray a branded storage oil, such as STA-BIL Fogging Oil, into the engine as directed as well as on any exposed metal parts of the snowmobile. Make sure not to get oil on the brake pads, rotor, clutches, or belt. Do not use a solvent-type oil, such as penetrating oil, or other aerosol light oils. Remove or Disconnect the Battery (for those snowmobiles with electric starters). Store the battery in a place where it can be charged periodically during the summer months. Plug the Air Box Inlet and Exhaust Outlet to ensure no mice or other rodents get in during storage. Drain the chain-case and refill with the recommended fluid. Leave a minimum amount of air pressure in the air shock (if snowmobile is equipped with one). Grease all Grease Fittings (Zerk Fittings) until grease comes out either near the base or at a relief valve. Inspect the Lube on the Drive Chain and lubricate if needed. My family has been wanting to take up snowmobiling this winter because we have heard it is a blast. It was really good to read about washing the snowmobile to remove dirt and corrosive salts and acids before storing it. It’s important for us to understand how to maintain a snowmobile before we buy one.